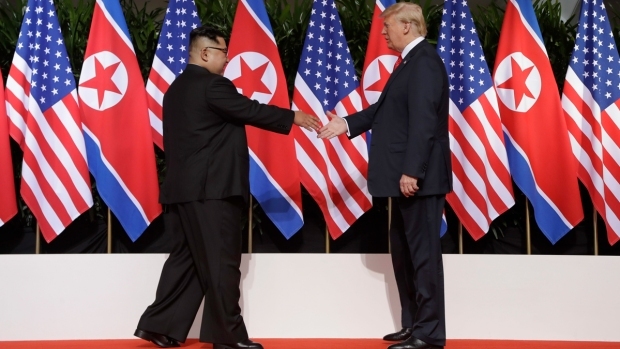 Clasping hands and forecasting future peace, President Donald Trump and Kim Jong Un committed Tuesday to "work toward complete denuclearization" of the Korean Peninsula during the first meeting in history between a sitting U.S. president and a North Korean leader. 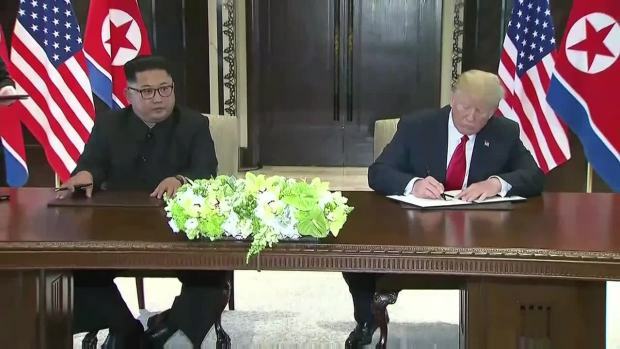 Yet as Trump hailed the summit's results, he faced mounting questions about whether he got too little and gave away too much — including an agreement to halt U.S. military exercises with treaty ally South Korea. Trump, holding forth at a free-flowing news conference after Kim departed, said the North Korean leader had before him "an opportunity like no other" to bring his country back into the community of nations if he follows through on pledges to give up his nuclear program, though he also acknowledged that the deal hasn't yet been sealed: "If you don't get the ball over the goal line, it doesn't mean enough." Both the South Korean military and U.S. Forces Korea indicated they had no advance knowledge of changes to military exercises. South Korea's Defense Ministry said it would first need to figure out the "exact meaning and intent" of such comments, echoing a stance taken by the presidential office. It had in recent weeks that there were no immediate plans between Washington and Seoul to modify the annual drills despite Pyongyang's anger toward them. A spokesman for U.S. Forces Korea said it "has received no updated guidance on execution or cessation of training exercises." Later, a Pentagon spokeswoman said the Department of Defense welcomed the "positive news" from the summit. "Secretary Mattis is fully aligned with the President and will continue to provide him with options to achieve his stated objective: the complete, verifiable and irreversible denuclearization of the Korean Peninsula," the statement said.